Arsene Wenger’s 18-year stint as Arsenal manager has been filled with high and low points. The high points seem to outweigh the lows, even if the club has failed to win a trophy for 8 and a half years. Here is a look at the highs and lows of Arsene Wenger’s Arsenal career since 1996. 1. Winning The Double 1997-1998. Wenger achieved a remarkable feat in his first full season in charge by winning the Premier League and FA Cup double. 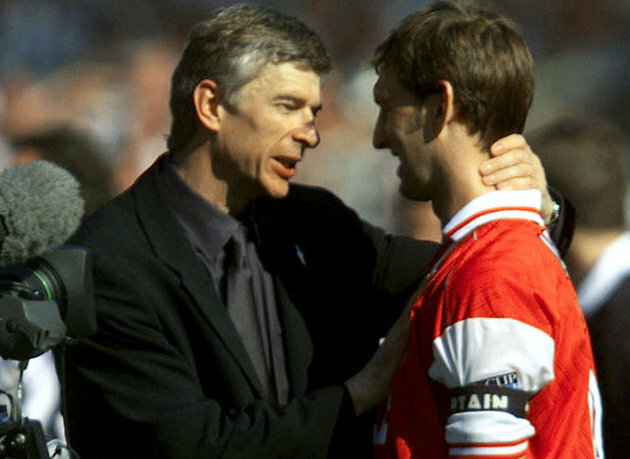 They sealed the league title with a superb 4-0 win over Everton, with captain Tony Adams scoring the final goal in the final minute of the final home game of the season. The double was completed 2 weeks later when they beat Newcastle United 2-0 in the FA Cup final at Wembley with goals from Marc Overmars and Nicolas Anelka. 2. 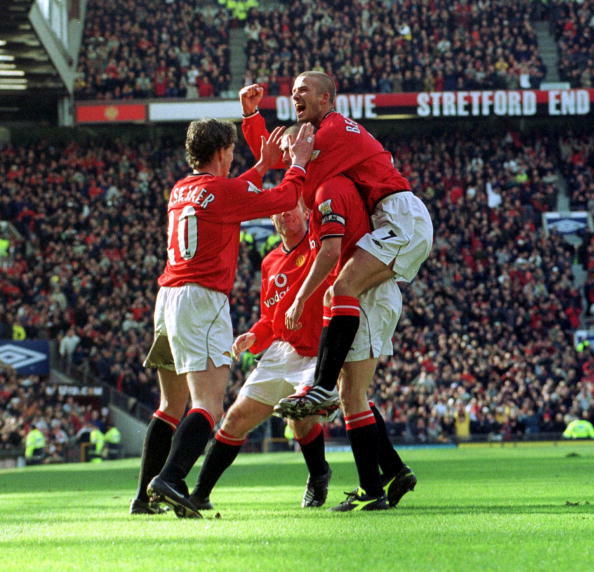 The Sheffield United FA Cup re-match 1999. One of the most extraordinary events in the long history of the FA Cup came about because of Wenger’s great sporting gesture following a 5th round tie against Sheffield United at Highbury in February 1999. Arsenal’s winning goal in the 2-1 victory came after Arsenal’s Nwankwo Kanu took advantage of a throw-in awarded after United had put the ball in touch so one of their players could be treated for an injury. 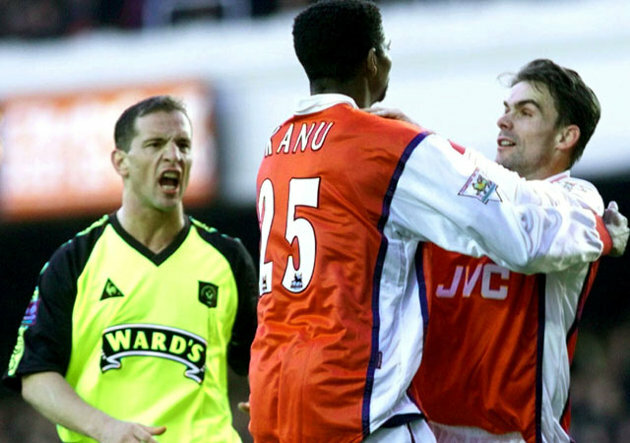 Kanu played the ball to Overmars, who scored. But that goal, while perfectly legal, breached the convention of giving possession back to the opposition in such circumstances. Wenger stepped in and offered to replay the game although he was under no obligation to do so and the FA accepted. Arsenal then won the replay by the same score. 3. Winning a Second Double in 2001-2002. 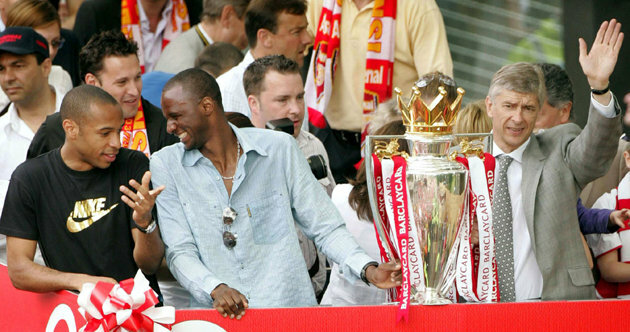 Arsenal clinched the title in the penultimate game of the season at the home of their then-fiercest rivals Manchester United, Sylvain Wiltord scoring in a 1-0 win at Old Trafford on May 8, 2002. The defeat ended United’s own title hopes. 4 days earlier Arsenal had won the 1st leg of the double when they beat London rivals Chelsea 2-0 at Cardiff to win the FA Cup for the 2nd time under Wenger with Ray Parlour and Freddie Ljungberg scoring. Although they did not win the double again, this season represents the highlight of Wenger’s reign so far. Arsenal became the 1st team since Preston North End 115 years previously to go through a league season unbeaten, but they failed to retain the FA Cup when they lost to Manchester United in the semi-final at Villa Park. Their league record read: Played 38 Won 26, Drew 12, Lost 0 and they scored 73 goals, conceding only 26. They have not won the League since. Their unbeaten league run lasted a record 49 games and ended in the October of the following season with a 2-0 defeat at, where else, Manchester United. 5. Real Madrid 0 Arsenal 1. One of the great wins in Arsenal’s history came on February 21, 2006, when a Thierry Henry goal meant Arsenal beat Real Madrid 1-0 to become the 1st English team to beat the Spaniards at the Santiago Bernabeu. The assured, mature performance by an under-strength Arsenal was enough to give them a 1-0 aggregate win in their Champions League 1st knockout round after a 0-0 draw at Highbury in the 2nd leg. They went on to beat Juventus and Villarreal before reaching the final against Barcelona in Paris where, despite having goalkeeper Jens Lehmann sent off early in the game, they took the lead through Sol Campbell but eventually lost 2-1. 1. The 2000 UEFA Cup final. 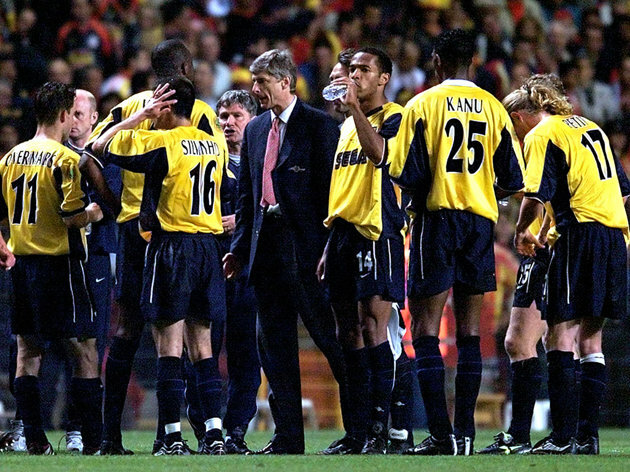 Arsenal completed a miserable treble of penalty shoot-out defeats on May 17, 2000, when they lost 4-1 on penalties to Galatasaray of Turkey in the UEFA Cup final in Copenhagen. Arsenal had gone out to both Leicester City in the League Cup and Middlesbrough in the FA Cup earlier in the season on penalties. But they went to Copenhagen the strong favourites to win their 1st European trophy since lifting the European Cup Winners Cup in 1994. In the event the match was a huge disappointment. After a goalless 120 minutes their only goal in the shootout came from Ray Parlour while Davor Suker and Patrick Vieira both missed. To complete Arsenal’s misery, Galatasaray’s clincher was scored by Gheorghe Popescu, who used to play for their arch-rivals Tottenham Hotspur. 2. Manchester United 6 Arsenal 1. Arsenal has been hammered twice by United during Wenger’s reign. The first occurred on February 25, 2001 when United won 6-1 at Old Trafford in the Premier League with Dwight Yorke scoring a hat-trick in the opening 22 minutes. He had put United ahead after 2 minutes before Thierry Henry equalised after 16 minutes. 2 more goals from Yorke, Roy Keane and Ole Gunnar Solskjaer put United 5-1 up by halftime while former Spurs favourite Teddy Sheringham completed the rout after coming on as a late substitute. 3. Manchester United 0 Arsenal 0. One of the most infamous matches under Wenger took place at Old Trafford on September 21, 2003 and ended with the points shared but reputations shattered. 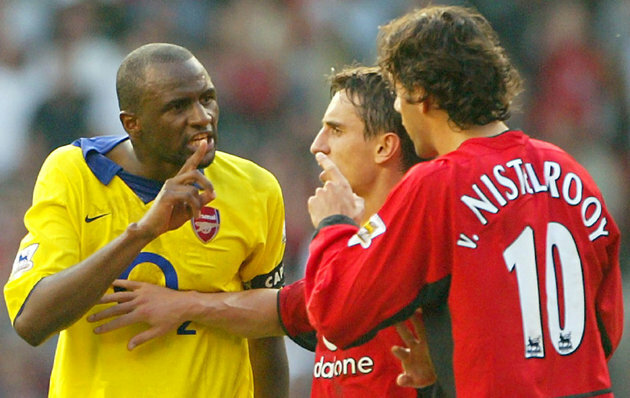 Vieira was sent off for a foul on Ruud van Nistelrooy but did not leave the pitch quickly, confronting Van Nistelrooy and provoking a melee between the opposing players. Van Nistelrooy subsequently missed a last-minute penalty which several Arsenal players celebrated in his face. As the match ended 2 minutes later, brawls broke out involving Ashley Cole, Cristiano Ronaldo and others while Vieira and Van Nistelrooy resumed their hostilities in the tunnel. If Van Nistelrooy had scored with the penalty, the “Invincibles” season would never have happened. 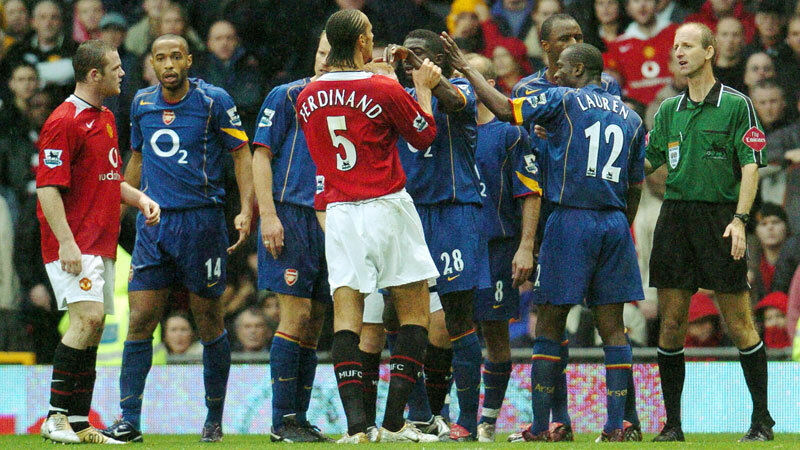 More mayhem at Old Trafford followed in October 2004 when Arsenal were beaten 2-0 by Manchester United to end their league record 49-match unbeaten run. After the game United manager Alex Ferguson and Wenger continued to row over comments Wenger allegedly made about Van Nistelrooy. As Ferguson wrote in an autobiography published last year, “Next thing I knew in the corridor I had pizza all over me.” The pair did not speak to each other for 5 years but have since been on various panels together. 5. Tottenham Hotspur 5 Arsenal 1. Arsenal have had by far the better record over arch-rivals Spurs under Wenger, but on January 22, 2008, Spurs finally beat Arsenal for the 1st time since 1999 with a thumping 5-1 win in the 2nd leg of the League Cup semi-final at White Hart Lane. The 1st leg had finished 1-1 at the Emirates but Spurs took control of the 2nd leg with goals from Jermaine Jenas, an own goal from Niklas Bendtner and a 3rd from Robbie Keane who made it 3-0 before halftime. Aaron Lennon made it 4-0 before Emmanuel Adebayor, now at Spurs, pulled one back before Steed Malbranque completed the rout. Arsenal’s misery was compounded by Bendtner and Adebayor rowing with each other before the end of the match. 6. Manchester United 8 Arsenal 2. It just had to be Manchester United again. Arsenal’s worst defeat since 1896 raised huge question marks over Wenger’s future at the club and whether Arsenal were still a force to be reckoned with in the Premier League. After 3 matches of the season, this August 2011 defeat left Arsenal 17th although they did recover to finish 3rd. On an afternoon of complete humiliation at Old Trafford, Arsenal were torn apart by a United team which won with a hat-trick from Wayne Rooney, two from Ashley Young, and other goals from Danny Welbeck, Nani and Park Ji-sung. Theo Walcott and Robin van Persie scored for Arsenal, but Van Persie missed a penalty against the club he joined in 2012.